This entry was posted on Wednesday, October 19th, 2011 at 05:15 and is filed under Foreign Policy, GOP Candidates, News, Politics. In talking to Wolf Blitzed, Blitzed asked Cain if he would negotiate away the detainees at Guantanamo in trade for the life of an American soldier. You can watch the video yourself. If this is the best he can do on foreign policy, I’m afraid I can’t support him. I realize he was trying his best to avoid being tricked into saying anything negative or contradictory about Israeli Prime Minister Benjamin Netanyahu, but a President simply must be faster on his feet. In a moment when Cain should have recognized he was out of his element, stopped, and thought the question through, he permitted himself to say something senseless: “I could make that call.” The US simply cannot afford to negotiate with terrorists, and this”call” by Cain would turn Khalid Sheikh Mohammed loose again if this had been a real decision. So really, the idea that we don't negotiate with terrorists is silly. And our current administration does not even want to call terrorists by their name, they want to give them Constitutional rights and prison meals and lawyers… Gheesh…. Rick, no doubt, there is what we do, and what we should do. What we are doing and what we should be doing are frequently completely different things, particularly under the current President. The problem is that I don't believe we should negotiate with them, at all, under any circumstances, for any purposes. Our answers to them should consist solely of ultimatums from us, and our overwhelming military response if they fail to comply. No deals. It just encourages them. Always has. Add that to what Cain did with Perry over the racist hunting park issue and there is no way I can support Cain. I don't want someone up there just because of his skin color. We need a true leader who has experience in governing and in dealing with the tough questions. Sorry, I just don't see it in the current crop of wannabees. As I look at the current situation with the GOP establishment pushing Romney for all they are worth and the lackluster group of GOP candidates, I ask my question (because I don't know) what is going to happen? I don't see the majority of state primaries selecting Romney. The Tea Party is way too strong. I don't see Cain winning a whole lot. (Maybe I am wrong, but I don't think he can cut it). And if I were a kingmaker (i.e. she who's name cannot be mentioned) who would you pick to endorse…good Lord have mercy. Maybe we try Rush Limbaugh's suggestion that we name Elmer Fudd to run on the GOP ticket. It is that bad!!! Is it possible we get to the GOP convention and no one is a winner? What will that be…a brokered convention? A free for all? I respectfully have to disagree Mark. As your previous commenter correctly state, we already do negotiate w/terrorists. Cain, said at the debate that he would not negotiate with terrorists, but would consider making that call depending on all the facts on a case by case basis. Should he have been quicker on his feet in the Blitzed interview or more nuanced or able to spin…..yes, maybe. But I think some of the appeal Cain has to many people is that he does speak his mind, he doesn't really cotton to the normal political correctness we find in most politcal candidates. Sometimes that means he says thing that aren't exactly PC or correct, but when he does he owns it and either stands by what he says or admits he made a mistake. That's refreshingly different than 99% of people who run for office. No one is 100% up on all issues, nor 100% right all the time. But few will say "I don't know". I'd rather have an honest candidate that is knowledgeable on key issues and willing to listen to the experts in others (generals in the military, rather than politicians). I guess I'm tired of all the spin by the majority. None of us are perfect and we are not electing a perfect candidate. Just as I would no more vote for Cain because of his skin color, I would not vote for Romney because he is so good at spinning everything he says. A big part of governing is knowing how to lead a team of people knowledgeable in many fields who are able to advise the leader to the best of their ability, and then the leader being able to make a sound and informed decision and act on it. 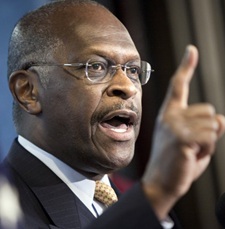 Currently we have a total lack of leadership and Cain has much experience at leading people successfully. He does not and cannot be versed in every area fully, but he can hire the best in each field and work with them for the best outcome. Anyone who believes the President alone makes all these decisions is foolish. I know that I will never convince any of you that a move towards non-interventionist foreign policy will help cure the many ills caused by the last several administrations, BUT! Which candidate, which potential Commander-In-Chief, if you will, best represents the interests of the men and women of our armed forces? "According to the analysis, the top three organizations that employ Romney’s supporters are Goldman Sachs, Credit Suisse Group, and Morgan Stanley. Reflecting his popularity with the everyman and our uniformed service men and women, the top three organizations that employ Dr. Paul’s supporters are the U.S. Air Force, the U.S. Army, and the U.S. Navy." I had not given Newt much thought because I know he has baggage and felt he probably had no chance. However, the way the debates are shaping up, perhaps what NY Graham says bears some thought!!!! Well said, Newt. This debate was an absolute disgrace. At this rate, we will definitely be handing Obama another four years. If you aren’t seriously considering Gingrich by now, you should be. He is an intellectual who understands the problems our country faces and has real solutions for them. He would crush Obama in any debate. When he gets to Washington he will be able to work behind the scenes to get things accomplished. And right now, he is the only one who looks more presidential than Obama (and that’s a pretty low bar). Here is my idea of the correct answer. We do not negotiate with terrorists. We rescue our citizens and terminate the hostage takers with extreme prejudice! Recall what happened with the hostages taken by the Iranian "students" when Jimmy Carter was President. On the day Ronald Reagan was sworn in as Carter's successor, the hostages were suddenly released. The real or imagined threat of the use of force by the U.S. with a President Reagan undeniably was the reason for their release.